Rava Sooji Semolina Recipes. Semolina is also known as Cream of wheat. In Indian languages, semolina is known as Rava /rawa/Suji/Sooji . It is made from the inner part of hard, durum wheat. Semolina has high gluten content. It is high in protein, dietary fiber, carbohydrates. As it is bland in taste, it can be used to make both sweets and savory dishes. Rava cooks quite fast so it can be used in many dishes. 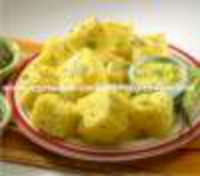 Semolina is used in making breakfast porridge, deserts, pasta dough etc. Semolina is mixed in batter to make pancakes. It is used in making breads in small quantity to get a tasty crust. In indian cooking, rava is used to make breakfast dishes such as Onion Upma, Vegetable Upma, rava Idli, rava dosa(vegan pancake), rava uttappam etc. 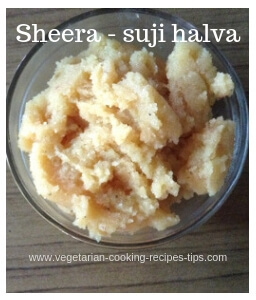 Semolina is also made in to a sweet dish called sooji Halwa or Sheera. Finer semolina flour is also used in many dishes. Rava is also used to make snacks such as Maddur Vada, etc. Semolina is used to make sweets such as rava ladoo, rava kheer, semolina pudding etc. Semolina is also made from Corn and Rice. In that case it is called Corn Rava or Rice Rava and are used to make Upma, Idli and many other dishes. 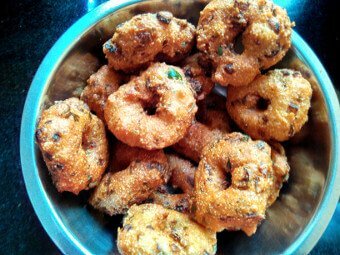 Quick rava/sooji vada / semolina fritters is a snack or breakfast recipe. 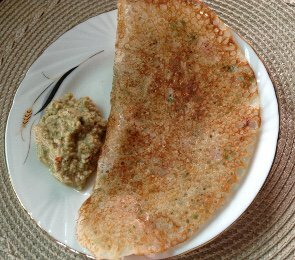 Instant crisp rava dosa for breakfast or any meal or a quick filling snack. 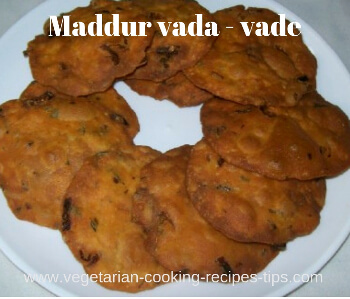 - Maddur vada is a specialty snack from Karnataka. It is yummy as a tea time snack or a picnic snack. Keeps for a week or so. Very convenient. 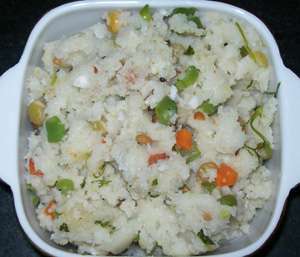 vegetable rava upma. Easy south Indian breakfast recipe. Known as uppittu (Kannada), tikhat sanja(Marathi), namkin halwa(Hindi) etc. Rava or sooji ki roti is a breakfast dish. Onion rava upma. Easy south Indian breakfast recipe. Rava pongal with moong dal is a one dish south Indian recipe. Make for breakfast or any other meal. Bread Upma- Quick Snack with a day old bread.